Yesterday I cooked for seven guests. Among the guests were my girlfriend of course, and also three colleagues from my former school and their partners. The idea was that they pay for the ingredients and I turn them into a dish. So, I started Monday with creating an ambitious 5-course menu and went to the shop. I had just one day to make everything, so it was an ambitious menu. It woke up early and started to cook at 6.30 am. First I made a rabbit stock and prepared my rabbit three ways: a rabbit meat ball, a rabbit roll and a rabbit drumstick. 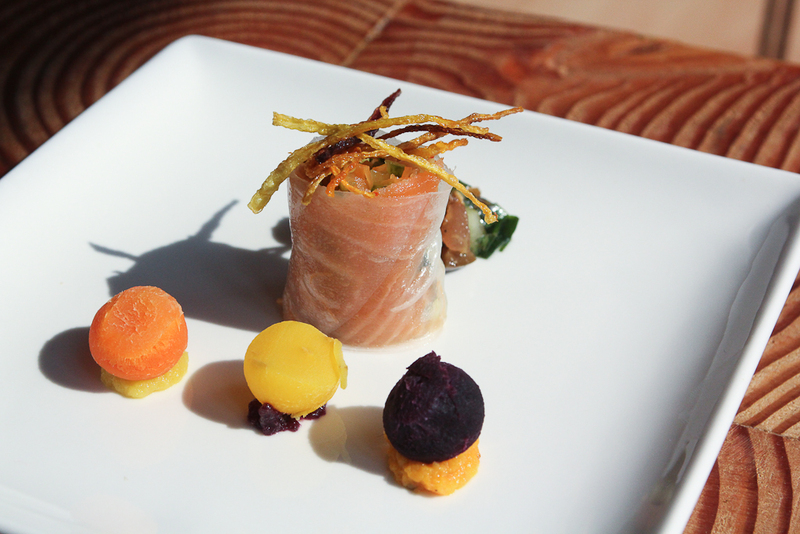 The next dish I made was the appetizer with the rice wrap. I will give you the recipe in the next days. Be aware, it’s a lot of work to make such a small appetizer. Although it’s a lot of work, it looks very nice…and it tastes good. I think it’s about 3 hours to make this small dish: the tomato-olive salsa, the purée of yellow, orange and purple carrots, the rice wrap, the deep-fried carrots. A big advantage is that you can make everything in the morning, so you don’t have to do anything when your guests arrive. The picture shows the result, what do you think? I cooked till the guests arrived, but it was worth it. The evening was great, they liked every dish, and so I was a happy “wannabe” chef. Thank you to my guests and thank you to my girlfriend who helped me. I will write down the recipes of the different dishes in the next days. 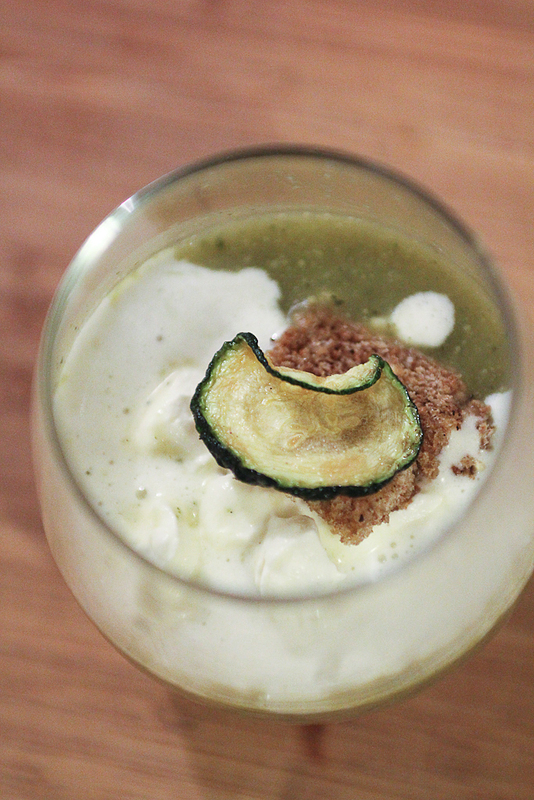 Just a little teaser: this is a picture of the Cappuccino of zucchini and “Pas de Bleu”, which was probably one of the best soups I ever made.